Last week I took a three day MSF basic rider course, passed the written and road tests, and got my Maryland motorcycle endorsement on my license. I’d never ridden a motorcycle before (scooters in tourist destinations, yes). I took the course at a H-D dealership because it was offering one of the last courses of the season. 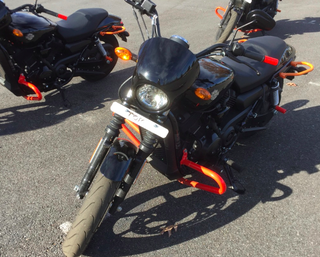 What I didn’t think to ask about was the training bikes: which turned out to be 500cc, 500+lb Harley Davidson Street 500s. As a newbie I just went for it and it turned out just fine. But most of the schools around here typically use smaller, lighter 250cc bikes. I really liked the 500cc bike, at least for training. It felt great, solid and stable the few times we were able actually ride them, looping the perimeter of the range. I’m wondering what experienced riders think about learning on smaller vs medium bikes. Are the smaller ones easier for the skill tests, or does the mass of the bigger bikes keep things more stable? Pro, cons, any thoughts would be appreciated!